The Tank Museum presents an exceptional retrospective exhibition of Renault tanks, some of which are completely unique. 2018 - The Tank Museum presents an exceptional retrospective exhibition of Renault tanks, some of which are completely unique. Renault has been part of France's history for more than a century. In 1911, Louis Renault started producing vehicles for the French army. 1914 – the Great War. Renault becomes a key player in this new war economy. It manages to provide weapons, ammunition, aeroplane engines, lorries and armoured vehicles. At Renault, just because there's a war on doesn't mean innovation has to stop. 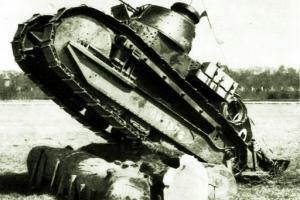 This tank has come to symbolise the First World War and was nicknamed the Victory Tank. It was intended as a replacement for the older Schneider and Saint-Chamond tanks – primarily "breakthrough tanks" which were less manoeuvrable and relatively fragile. In 1916, General Estienne (considered by many in France to be the father of the modern tank) asked to meet Louis Renault to discuss a project to design a revolutionary new tank. Having first turned down his request, Louis Renault eventually told him: "General, I'm going to build you your tank". He quickly started work on a prototype. The General had been extremely clear in his request. He wanted a light, rapid tank that was effective in combat, easy to build, inexpensive and well suited to mass production. On 22 December 1916, Louis Renault got behind the controls of his prototype and gave the first official demonstration before France's military authorities. This armoured vehicle was completely modern, light, easy to manoeuvre and highly effective. It featured a turret that could rotate through 360°, outsized tracks and a rear engine separated from the crew compartment. This revolutionary design still features in today's tanks. Renault's light FT tanks had their battlefield debut on 31 May 1918 between Bétheny and Neuville, just north of Reims. 30 of them successfully broke up a German advance on the other side of the river Marne. 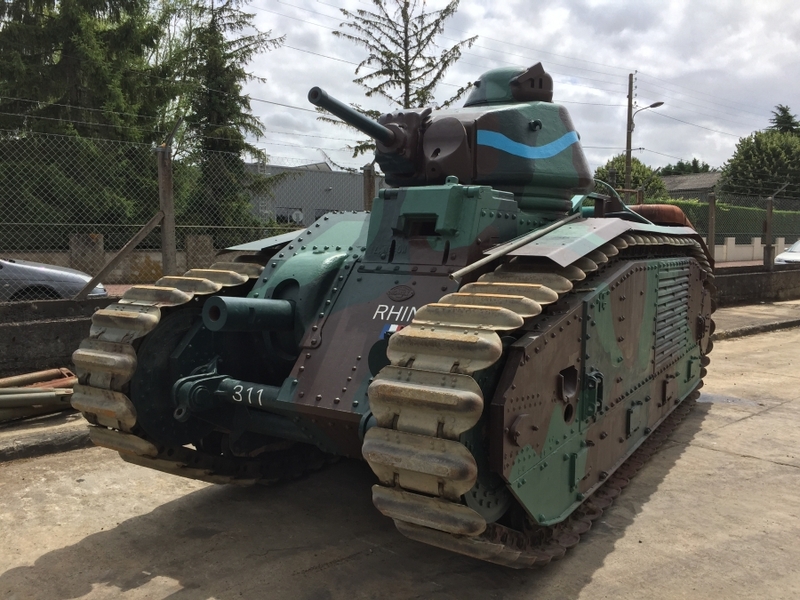 20 years later, the Renault FT was still in operation at the start of the Second World War. The FT tank was exported to many other countries: Finland, Estonia, Lithuania, Poland, Romania, Yugoslavia, Czechoslovakia, Switzerland, Spain, Belgium, the Netherlands, Brazil, China, Japan and Iran. And around 700 were also built under licence in the United States. Fuel consumption: 30 litres per 100 km. 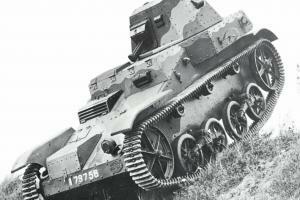 In 1931, Renault began investigating the feasibility of an armoured machine-gun vehicle on tracks, complete with turret for the cavalry divisions. Thanks to the 8-cylinder engine mounted on Renault Reinastellas, the AMR could reach speeds of 50 km/h and was well suited as a reconnaissance vehicle with excellent all-terrain abilities. This light tank was used up until 1940. 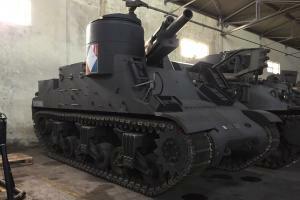 The model on show is the only one still in existence of the 123 that were built, and is part of the Saumur Tank Museum’s collection. Fuel consumption: 64 litres per 100 km. In the early 1930s, the 1917 Renault FT was still in use across most of the French army. But the time had come to design a more powerful tank. The specifications were quite precise: a crew of 2, a minimum weight of 8 tonnes, an engine that could drive it at 20 km/h, irrespective of the slope, 8 hours of autonomous operation and a 37-millimetre semi-automatic gun twinned with a 7.5 mm machine gun. 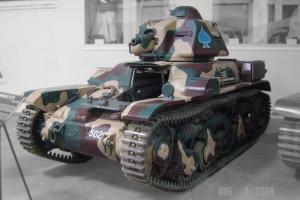 Renault built 1540 R35 tanks between 1935 and 1940. This tank was sufficiently armoured to withstand blasts from small-calibre guns. The crew was made up of a driver at the front, and – at the turret – a commanding officer/shooter who just sat on a leather strap. This tank was also used by the Polish, Romanian, Yugoslav and Turkish armies. Fuel consumption: 200 litres per 100 km. With its enveloping tracks, its 75-mm gun on the left-hand side of its body and a 47-mm turret gun, this 32-tonne tank was extremely impressive. The powerful 6-cylinder 307 hp Renault engine was derived from an aeroplane engine. The tank's steering, together with the 75-millimetre gun's aim, was managed by a fully-hydraulic Naeder type transmission system. In those days, this was a very modern method. In battles, the B1 Bis was feared by German armoured vehicles. It was powerfully armed and its shielding was so thick that enemy shells could not get through it. But such a monster required a great deal of maintenance, rigorous training was needed to drive it and it was extremely inefficient: the B1 Bis guzzled 330 L of fuel for every 100 km it travelled. Of the 400 B1 and B1 Bis tanks built, only 11 remain, some of which are wrecks. 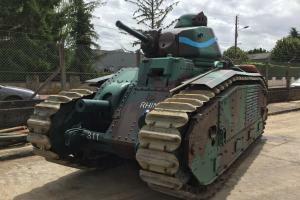 The model on show is the only one still in working order, and is part of the Saumur Tank Museum’s collection. 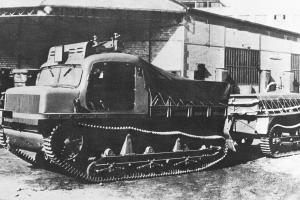 This light Renault tractor was designed to refuel tanks during combat and supply them with more ammunition. It would be loaded with 800 kg of shells and cartridges. Its cab was derived from a small civilian truck which lent it an extremely modern appearance. This tracked tractor pulled a 600 kg trailer which carried a 450 L petrol tank, oil cans and water. The vehicle was presented to the military authorities in January 1938. Of the 260 that were originally built, eight still exist. This year, the team at the Saumur Tank Museum will present the M7 Priest self-propelled artillery vehicle, performing outdoor dynamic demonstrations outside hall 1. It was nicknamed the "Priest" by the British Army because it featured a small open turret which bore a curious resemblance to a priest's pulpit. The engine which powered this piece of artillery was just as impressive – a superb Ford V8 (that one might just as easily expect to find in a sports car), built entirely out of aluminium and featuring two cylinder heads with four overhead camshafts, 4 valves per cylinder. Its 18 L developed 500 hp and it guzzled 500 L of petrol per 100 km.